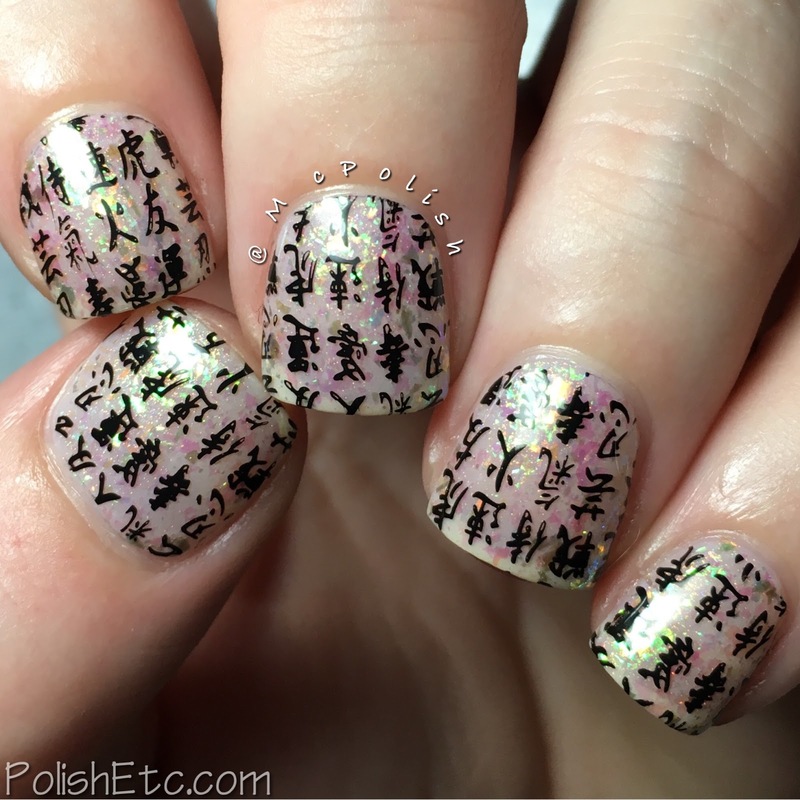 Delicate Print Nails for the #31DC2016Weekly - Polish Etc. For this week's prompt, we are doing nail art using delicate print. Typically, I have always some kind of stamping with a delicate floral design. But this year, I decided to go more literal. 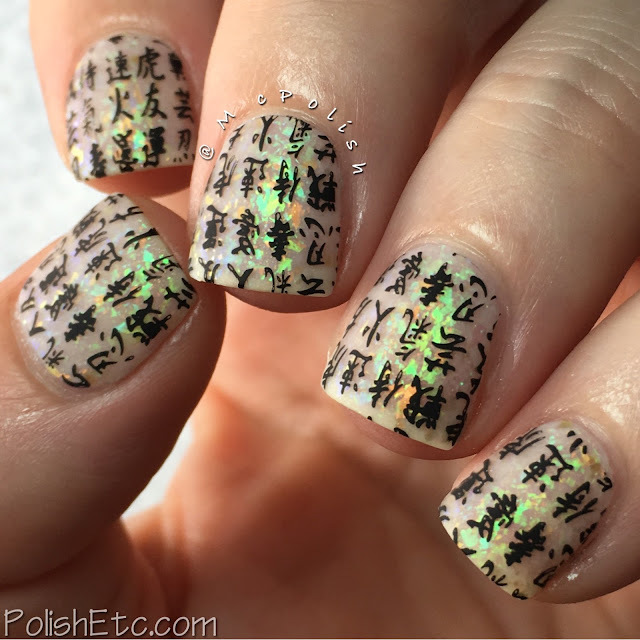 I used a stamping image from the UberChic Far East 01 plate that was delicate Japanese writing. So it's the delicate printed word of a pretty language. I am about 50% sure that the writing on my nails is Japanese. And I am pretty sure that I stamped them upside down. So, if it is not Japanese then is must be Chinese. There are both Japanese and Chinese elements on this plate, so I am unsure. I'm sorry. But I think it looks pretty damn cool! The true star of this mani is the base. I started with a layer of Essie "Adore-a-ball" which is a sheer off-white jelly. Then I topped it with two layers of Digital Nails "Crotch Ice" and one layer of Digital Nails "Crush Leaves, Not Dreams". Both of these are shifty flakie toppers with amazing shifty shimmer. Crotch Ice is more blue/green and Crush Leaves is more orange/copper. Both are beautiful and look like magic on the nails. After stamping over the flakie base with black polish on the UberChic image, I tried both a glossy and then a matte top coat. You know I have to MATTE ALL THE FLAKIES! Some of these photos I took under two lights to show off the shiftiness of the flakies. I also tried to do a black frame around the nail and it just turned out crappy. But if I had done it correctly, it would have looked bomb. Oh well! So what do you think of these nails? I thoroughly enjoyed them. Even if the stamp is upside down. We are just about half way through the #31DC2016Weekly. The prompts will be getting much more challenging as the weeks go on. Are you enjoying this series? Let me know! 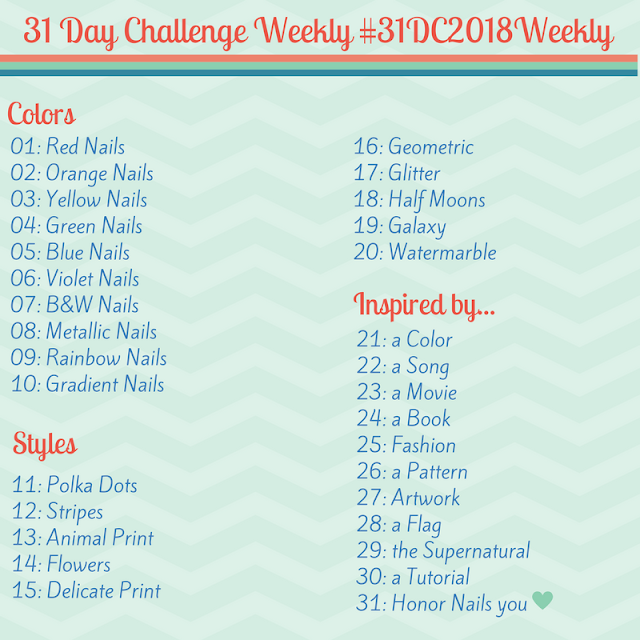 And be sure to check out all of the other participants manicures by veiwing the #31DC2106Weekly tag on Instagram, Twitter and Facebook. Join in anytime you would like! You neeeed to do some #flakiesovernakies!